A few weeks back, I shared my #PetHappy story about my new kitten, Reggie, and hosted a giveaway for a PetSafe prize pack valued at $500. Debbie Bashford was the lucky winner. Congrats Debbie! I also told you about the PetSafe Canada contest to win a year’s worth of PetSafe product (valued at $2500). Entrants had to share their own #PetHappy stories on Facebook. PetSafe Canada has crowned the lucky winner. 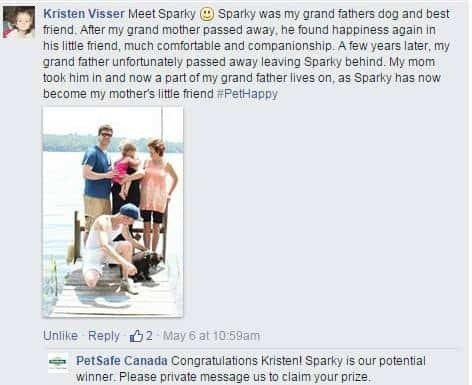 Congrats to Kristen Visser for sharing her winning #PetHappy story about Sparky! The story of Sparky is quite touching. Sparky was Kristen’s grandfathers dog. He was lonely after his wife sadly passed away and Kristen’s family wanted to help out. Kristen found Sparky on a local website and knew he would be perfect for her grandfather. She was right. Her grandfather (and the whole family) fell in love with Sparky and was a wonderful friend and companion. After her grandfather passed away, Sparky went to live with Kristen’s mom. Her story shows you that animals can bring such joy and comfort to one’s life. They can easily become our best friends as Sparky has done in Kristen’s family’s case. Read the winning #PetHappy story below! Here is a picture of Sparky with Kristen’s family. What a cutie! I had the opportunity to ask Kristen a few questions to learn more about Sparky. How did you meet Sparky? I was looking for a companion for Dad since Mom had died and he was so lonesome. 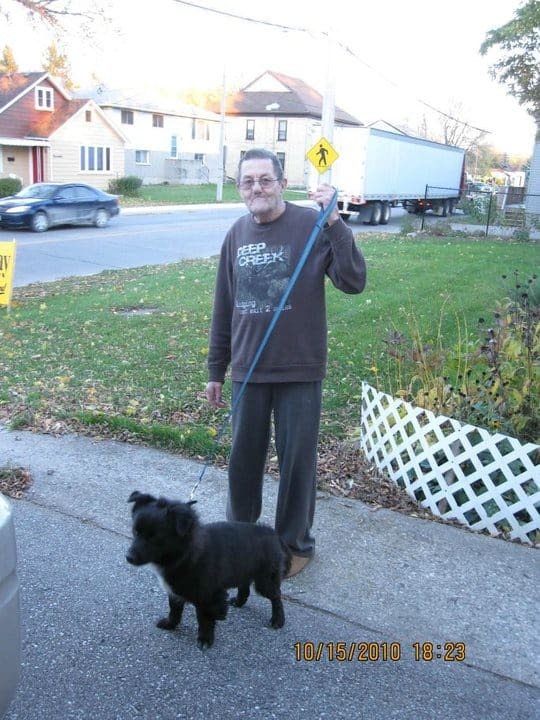 So I looked on Kijiji and the moment I saw Sparky, I knew that he was the answer to Dad’s loneliness. I contacted the owner and set up a time to meet him in Stratford. My sister and I walked up to the door and knocked, the owner answered. Sparky came out and ran right to my sister’s SUV, turning to look at us with an expression that said, “you’re taking me with you right?”. It was love at first sight and an inner knowing that he was perfect for Dad. What is your favourite way to spend time with Sparky? Sparky is my protector and my buddy. He follows me everywhere. Wherever I go, he follows. I love when I go to bed, he jumps up on the bed and snuggles up against me. I go right to sleep knowing he’s there to watch over me. What is Sparky’s personality like? Sparky has the sweetest disposition. He loves everyone and I constantly hear from other people that we cross paths with while walking about what a happy dog he is. So precious. It brings tears to my eyes to hear Sparky’s story and how he has touched many lives in such a meaningful way. It’s definitely a worthy #PetHappy story. Congrats Kristen on winning and I hope sweet Sparky enjoys all his prizes. He’s a lucky guy! Look how adorable Sparky is! Great news all round. loved reading about this! he is precious.